For the past few weeks we've been watching all of the Harry Potter movies with Anne. By the time we made it the 5, 6, and 7 she had mostly lost interested because she just wasn't sure what all was going on, but she didn't want to stop watching. After the last movie, she decided that she wanted to make a Hermione doll. This is what came of it. Of course, I help her some, but this was totally her design and she did lots of the sewing. I haven't let her have free reign to the sewing machine...I'm afraid I'm a little too OCD for that just yet. Now she wants to make Harry and Ron. I told her we could ONLY if she makes their legs and arms wider...this thing was a booger to turn and stuff! 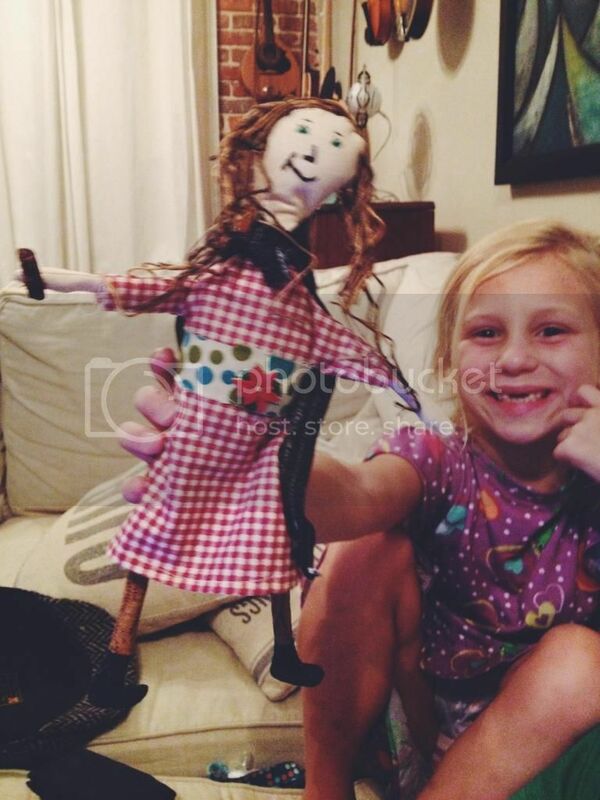 I love that children are so creative and am so very thankful for this little girl. Which reminds me of this Ted Talk. Parents and teachers, give yourself 20 minutes and LISTEN to it...good stuff there.